What is the best cargo van in Canada? We’ve looked around and found that there are not many accurate comparisons of full size cargo vans in Canada, so we decided to do one ourselves based on specs that we feel our relevant to trades persons and fleets. We are, however, going to remain neutral as to which vans trump the others. Instead we are going to lay out the facts and state why we like each van. It’s up to you to decide which cargo van is best for your needs. Full size vans have gone through a transformation over the past five years. From the traditional body styles to Euro styling, a majority of the major OEM’s have redesigned to a more aerodynamic body, more efficient engines, and lighter overall structure in view of maximizing fuel economy. With this transition came a much wider variety of roof heights and wheelbases which provides trades people and mobile technicians with more of a challenge when trying to make a choice. The Mercedes Sprinter was the first cargo van to come to Canada with the Euro Style and High Roof option, having made its entrance in 2001 under the Freightliner name later being available under the Dodge name and finally becoming known as the Mercedes Sprinter in 2010. Let’s take a look at what the Sprinter has to offer today. The Sprinter High Roof, 170” Wheelbase Extended Body, boasts a massive cargo area of 530 cubic feet. How heavy of tools and equipment can you carry in of these bad boys? The 144” Wheelbase Regular roof van with the V6 has a maximum payload of 5497 lbs. What’s under the hood? The standard option is a 2.1 L 4-cylinder Diesel with 161 horsepower and 265 lb-ft of torque. There is the option to upgrade to a 3.0 L 6-cylinder Diesel with 188 horsepower and 325 lb-ft of torque. The towing capacity is quite suitable and the 3500 Model is rated to tow a maximum 7500 lbs. So what’s our thoughts on the Sprinter overall? Overall the Sprinter is definitely a solid choice and is at the top of the game for mostly everything that a tradesperson or mobile technician needs. It also has a 4×4 option which isn’t available currently by any other full size van. The name also carries weight, which does impact the brand of your company. One drawback we see is the upfront cost which starts around $45,500 – $56,500 and although service is required less often than the contemporaries there also is a smaller dealer network than others which can be a hassle if you aren’t within a close vicinity. Obviously cost is always a consideration but we would strongly encourage those that are looking at making the investment to take into consideration costs outside of the upfront cost. 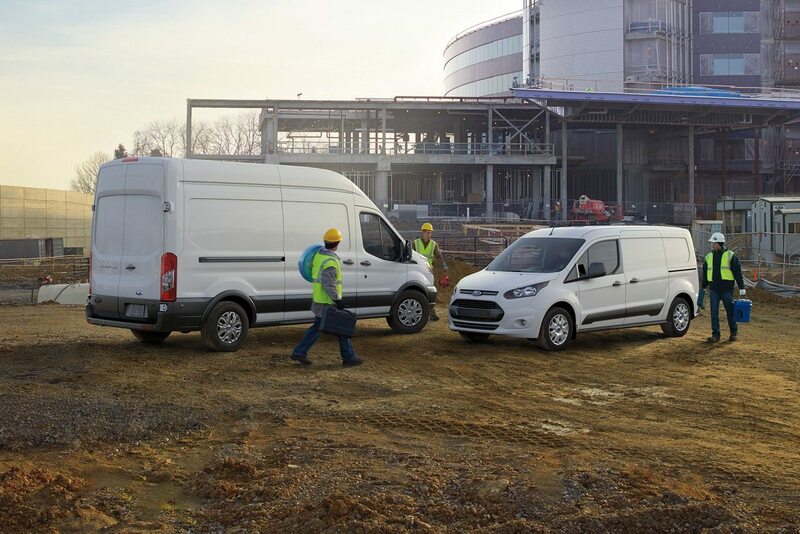 The Ford Transit is currently the most popular full-size van on the market. It was first introduced to Canada in 2014 and has more recently replaced the traditional E-Series Vans. So how does the Ford Transit stack up? With a spacious interior the Transit has a cargo space of 487 cubic feet in their largest version, the high roof 148” extended wheelbase. What can we carry in the Transit? The 350 HD version with the 148” Extended Wheelbase has a maximum payload of 4650 lbs. The Transit comes with three options. The standard option is a 3.7 L V6 with 275 horsepower and 260 lb-ft of torque. You can upgrade to what Ford calls the Ecoboost which is a Turbocharged 3.5 L V6 with 310 horsepower and 400 lb-ft of torque. There is also a diesel option, a 3.2 L 5-cylinder diesel with 185 horsepower and 350 lb-ft of torque. Similar to most of the other cargo vans the Ford Transit has a maximum towing capacity of 7500 lbs. This is specific to the 148” low roof version. So what’s our thoughts on the Transit overall? It’s a great option which runs middle of the road in regards to capabilities and comes at an affordable upfront cost starting around $36,719 – $52,084. With so many versions available there is definitely a Transit that will suit your needs. Ford itself boasts a very wide network of dealers which is very beneficial for parts and service. The Ram ProMaster has recently stepped up its game and has become a strong contender in the full size van market. What does the Ram ProMaster have to offer? The ProMaster flaunts a decent amount of space with 463 cubic feet in their High Roof 159” version. Again the payload remains competitive with the other cargo vans with a max payload of 4440 lbs in their 3500 Model. The ProMaster comes standard with a 3.6 L V6 has 280 horsepower with 295 lb-ft a torque. There is also a diesel option which is a 3.0 L 4-cylinder diesel which has 174 horsepower and with 295 lb-ft of torque. The towing capabilities is pretty good for a front wheel drive van but is at the bottom of list at a maximum towing capacity of 5100 lbs. So what’s our thoughts on the ProMaster overall? Well to be honest, it is your best bet for upfront cost starting at $29,695 – $43,790 as long as its average capabilities are sufficient for your needs. It would also be our favoured option for city driving with its best in class turning radius and maneuverability particularly because it is the only van with front wheel drive. We are still struggling with its odd looks but hey no hard feelings. Nissan NV has made a splash in the full size van market and is another good option for trades people and mobile technicians. What are the specs of the Nissan NV? The Nissan NV has less options regarding roof height and wheelbase length compared to the other options. At least you aren’t overwhelmed when making a choice! This translates to a cargo area of 323.1 cubic feet in its High Roof version. Payload is less than the others but not drastically enough to be a deal breaker in our eyes. It can carry up to 3937 lbs in the 3500 HD model. The Nissan NV comes with both a V6 and a V8 but no diesel option. The 4.0 L V6 has 261 horsepower and puts out 281 lb-ft a torque. The 5.6 L V8 has 317 horsepower and churns out 385 lb-ft of torque. 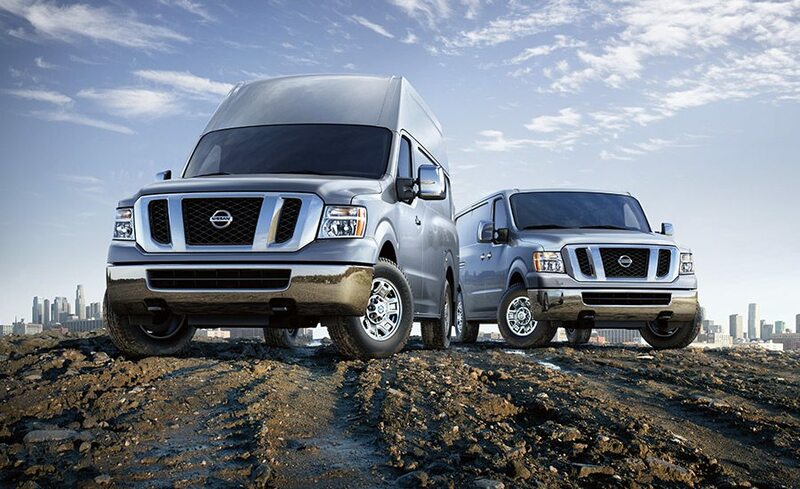 One of the main benefits of the Nissan NV is its towing capabilities. The V8 can tow up to 9500 lbs, which is quite impressive. So what’s our thoughts on the Nissan NV overall? The NV is a good option for someone with a serious towing requirement and likes the option of a high roof van. It also comes at a decent up front price starting at $34,688 – $39,498. Its looks? Some people love it and some people hate it. We’ll leave that for you to judge. The last of the traditional vans from the previous millennium, but these guys are tried and proven. What do the Chevrolet Express and GMC Savana bring to the table? The extended wheelbase version of both the Savana and Express have a cargo capacity of 284.4 cubic feet. This is less than the other full size vans due to the lack of high roof option. Payload is decent maxing out at 4000 lbs in the 3500 model. The main differentiator between the Express and the Savana is the available engine specs. Both come standard with a 4.8 L V8 which has 285 horsepower and 295 lb-ft of torque. The Express has an upgrade option that puts out some serious grunt. A 6.6 L Turbodiesel with 260 horsepower and 525 lb-ft of torque. The Savana also has an upgrade option which is a 6.0 L V8 with 342 horsepower and 373 lb-ft of torque. The biggest thing these traditional vans have going for them is their towing capability which is rated for up to 10,000 lbs. So what’s our thoughts on the Savana and Express overall? Not sure what to say. Cost is still quite affordable coming in at a starting price of $35,826 – $39,925. These beasts have a solid engine and overall structure that pack quite a punch specifically when doing mountain driving and when required to haul big loads. Each cargo van on the market today has it’s strong points so it’s tough to point out one specifically and say it is the best cargo van hands down. We advise that you make a decision based on what specifications are most important to the work that you do. Good luck on your cargo van acquistion and feel free to let us know what you think is the best cargo van in the comments! If you have any requirements for Shelving Packages, Ladder Racks, Flooring, Wall Liner Kits, or any other accessories feel free to get in touch with our Sterling team and we will be happy to help you out.